I am one of those apparently rare guitarists who doesn’t like Telecasters. Don’t get me wrong – I appreciate their tone and I understand their place in the history of music as we know it, but every time I play one I walk away thinking that it has to be about the least ergonomically designed guitars on the planet. Being a Guild collector, though, when a Guild T250 guitar came up for sale I had to buy it to see if my favorite guitar brand could somehow change my mind about the venerable Telecaster. Let’s take a look at this relatively uncommon Guild electric guitar. I’m not going to bore you with the history of the Fender Telecaster because there’s enough information on the Internet about that iconic guitar’s history to last a lifetime and the Internet certainly doesn’t need another, certainly from someone like me who’s never really bonded with one. The Guild T250, though, is another matter. With little info out there on this interesting guitar, I grabbed one in order to write up some detail about it. But first, let’s talk about Roy Buchanan. Roy Buchanan is described on his Wikipedia page as a pioneer of the Telecaster sound. Guitarists the likes of Gary Moore, Danny Gatton, and Jeff Beck list him as an influence and if you read that Wikipedia article you’ll see references to Jimmy Page and The Rolling Stones as well. The readers of Guitar Player magazine listed Roy Buchanan as #46 in the top 50 readers’ poll of the greatest guitar tone of all time (October 2004). And yet, as a guitarist with some decades under my belt, I’d never heard of him. Sadly, I’m not alone. Roy Buchanan never came to the forefront of fame like those he inspired. As a dopy hair-band lover in the ’80s he was outside my realm of notice because as much as I love and have always loved Guilds, in the late 1980s I was chasing the tone of guys like Eddie Van Halen and George Lynch while lusting after guitars from Jackson and Charvel. I was never a Tele player, and though I’ve always loved the blues, I was sadly just too mainstream to have discovered Roy Buchanan. By the way, I borrowed this picture of Roy with what appears to be a Guild T250 from this excellent collection. I encourage you to take a look. 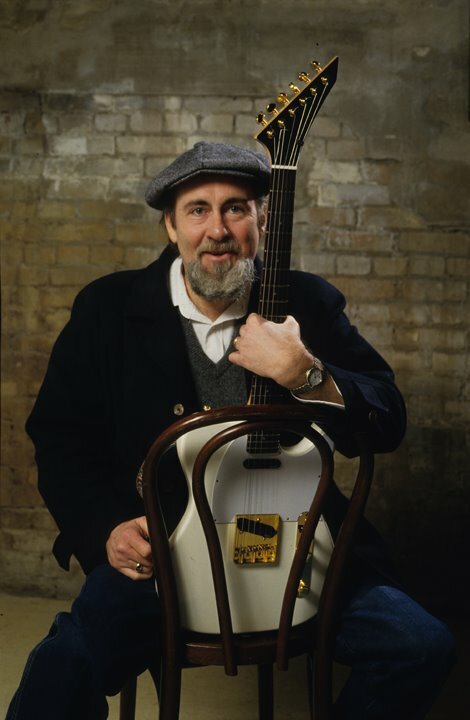 You may also wish to check out this old-school webpage I found on AltaVista of all places which seems to have a fair bit of information collected on Roy Buchanan. Roy was famous for playing a 1953 Telecaster that he named Nancy, and as a lover of vintage instruments I find it fascinating that he would play a (then) modern Guild instead. If you look at the picture above you’ll see that he’s taped over the Guild logo on the headstock of his (assumed) T250. There is a fair bit of discussion on the Internet as to why he did this, with some saying he disliked the guitar and some saying he was mad at the company. Personally, I find it hard to believe that he disliked the guitar because there are a lot of pictures and videos of him playing it. I could buy that he was mad at the company, but until I read that from a reliable source I’ll just have to acknowledge that he covered up the Guild logo without professing to know why. 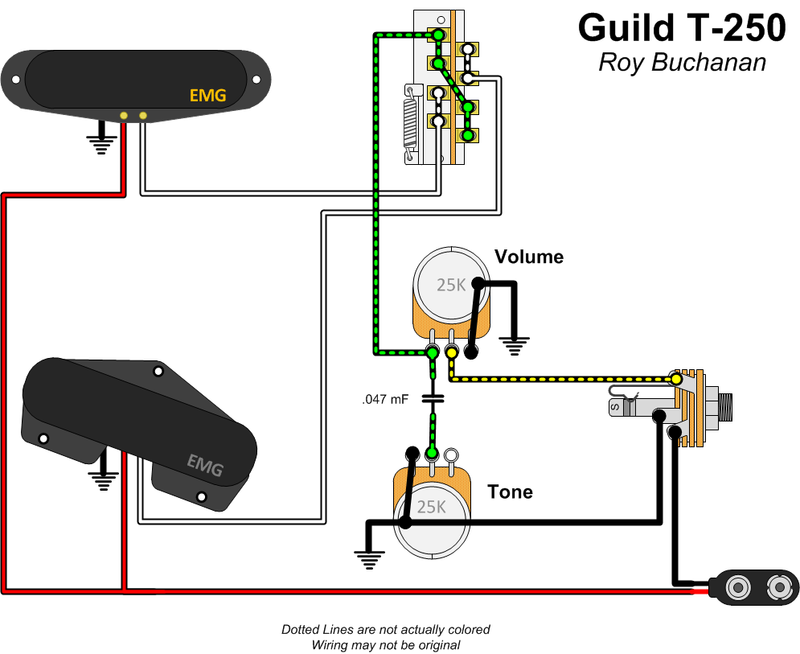 Technically, the Guild T250 is not a Roy Buchanan model. 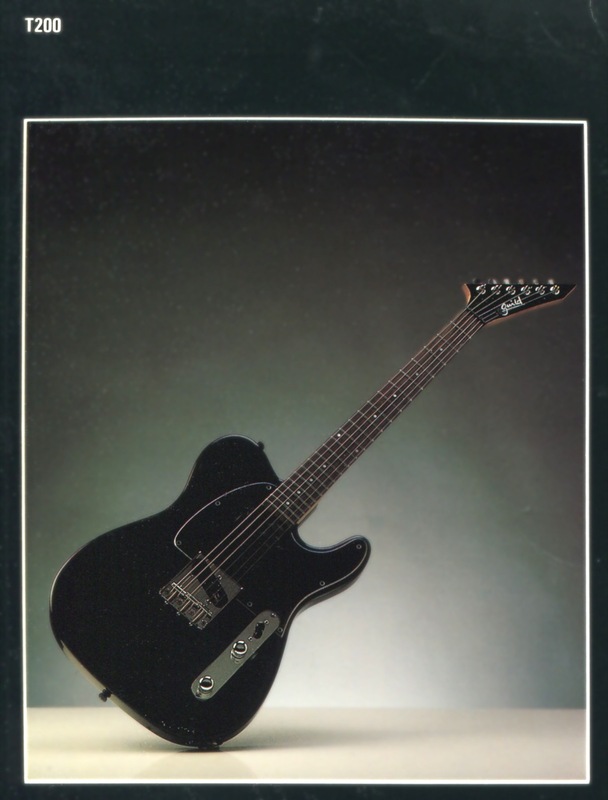 In the 1986 price guide there is a T200 Roy Buchanan model listed with a list price of $799. All it says in the description is 1 H.B., 2 Single Coils which does not match the picture in the catalog for that year, but then Guild isn’t known for it’s super-accurate price lists or catalogs. 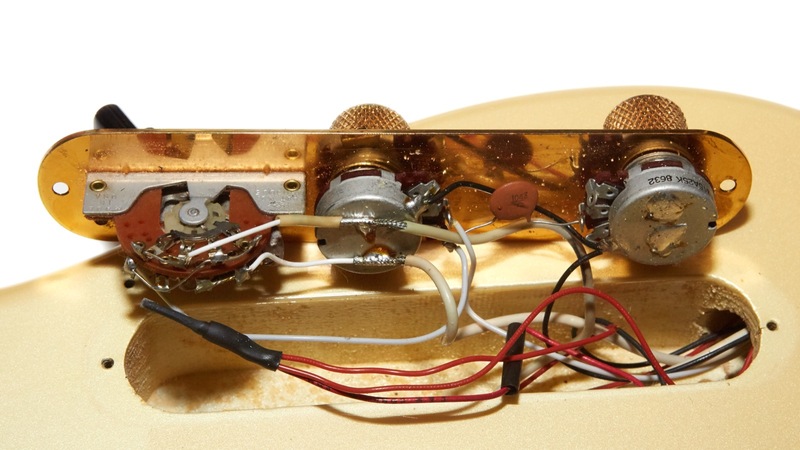 From what I can tell looking at the picture in detail, there are not three pickups and the bridge pickup is not a humbucker, though I suppose it’s possible that it’s a stacked coil design. I think it’s more likely that the price list is just wrong though I can only assume based on the data at my disposal, which admittedly isn’t much to go on. 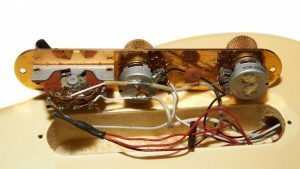 If you look closely at the T200 picture, you can see that the guitar has chrome parts and what appears to be a traditional ashtray-base bridge plate along with the traditional 3-saddle design found on early Teles. While I’m not a fan of the ashtray bridge plate (named for the matching bridge cover from original telecasters that many players literally used as an ashtray), I think it adds a bit of legitimacy to the guitar in balance to the goofy headstock. I don’t recall ever seeing a T200 in the wild which is a shame because I think the chrome parts are much more in line with the telecaster shape than the gold parts found on the T250. 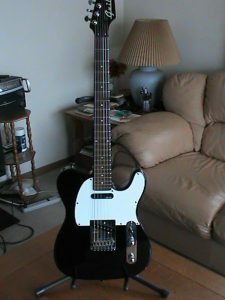 With the old-style bridge and saddles the T200 could have been a Guild Tele that people would have probably liked, except for the terrible headstock choice which probably seemed like a good idea back in the mid-late 1980s. 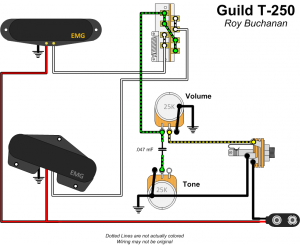 The Guild T250 is not a Roy Buchanan model, and when I originally wrote this piece I thought it was but thanks to this thread on the LetsTalkGuild forum, I was set straight and changed this article a bit. The proof is in the 1987 price guide shown to the right which has not reference to Roy Buchanan in the description of the T250. I think I must have succumbed to the Internet misconception that Roy Buchanan and the T250 are connected because I think every T250 I see mentioned online has Roy’s name along with it. 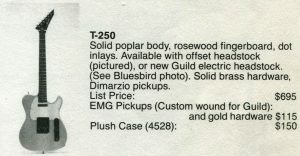 I would have declared that one of the defining features of the Guild T250 was gold hardware since that’s all I ever see, but the 1987 price list seems to indicate that the gold hardware came as an option when EMG pickups were included. I’ve only ever seen one T250 with chrome in the wild (which I’ll talk about in a bit) aside from the one in the catalog which is a shame because I really like the look of chrome on this guitar. Once again a major instrument manufacturer went and designed a guitar without getting my input. Crazy, right? 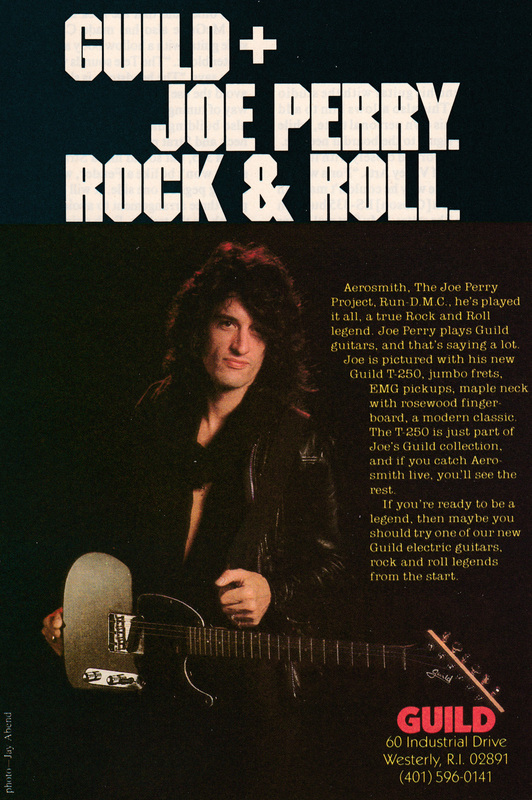 Another example of a chrome-laden T250 is shown in this ad from 1987 showing Joe Perry and his Guild T250. This one’s basically the same as the one in the catalog and it wouldn’t surprise me if it is the same guitar, though of course that’s pure speculation on my part. Note that nowhere on this ad does the name Roy Buchanan appear which may add credence to the theory that Roy was angry with Guild for not using his name when advertising the guitar he helped to design. It certainly adds to the proof that I was wrong to originally call the guitar a Roy Buchanan. I’ve shown Joe Perry with Guilds before, notably with his S284 Aviator. I loved Aerosmith in the ’80s and I’ve always loved Guilds and I’m honestly kind of shocked to see how many Guilds he had. I guess I was too busy chasing girls practicing to notice. I had never seen a T250 with anything but EMG pickups until my online research led me to this page which shows not only Dimarzios but a very welcome cake-knife headstock! Holy crap – it’s perfect! If you’re reading this and happen to own the black and white T250 I’m about to talk about, please sell it to me! In my mind, the guitar in that ad (shown to the right) would be close to the the perfect Guild Telecaster. 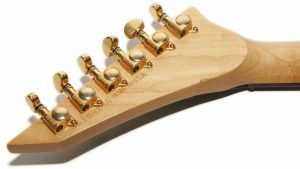 The headstock is far more acceptable than the pointy business on the one in this review (though I still think the foot headstock would be better), and the hardware is all chrome! I like the black finish and the black with the white pick guard gives it a tuxedo look that just works for me. I’d probably prefer the look of the saddles on the T200 but I’d take a freaking horse saddle in return for the abandonment of the pointy headstock. 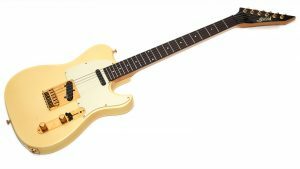 Regardless of the historic details, so far as I can tell the T200 and T250 guitars are the only Telecaster-type electric guitars that Guild ever made (at least that I could find). One could argue that the Crossroads CR01 might be included in that list but that guitar has a very different design and is really only Tele shaped. 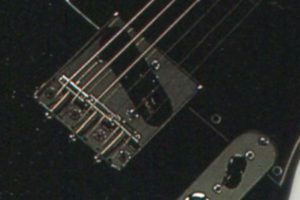 As I already wrote, the T250 doesn’t seem to have a great reputation among Telecaster lovers, so let’s see how it fares when evaluated by this Guild lover who’s never been a fan of Teles. The finish is typical Guild goodness, though I’m not entirely sure what color this guitar may have been originally. 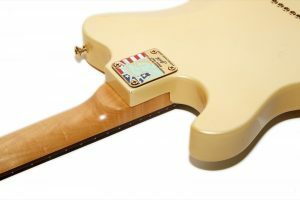 My guess would be a sort of ivory as evidenced by the color shown under the pick guard. I could also not find a list of colors offered for the T250 when it was sold. I have seen them in black, sort of a Pelham blue, a seafoam green, red, and this ivory color, but since I couldn’t find an official document describing options that may not be an inclusive list. My guess for this guitar is that it’s finished in poly but there are no wear points or indications of what the finish might be apart from feel and I’ve felt plenty of both finishes to know that it’s not a good indication of type. I’ve also been wrong before. This is a long scale guitar like most all Telecasters and their ilk, though true to Guild specs this guitar is not 25 ½” but rather 25 5/8″. I’m not sure why Guild long-scale guitars measure in at 25 5/8″, but the difference doesn’t seem to affect the guitar in any way that I’ve ever noticed. The neck measures an almost perfect 1 5/8″ wide at the nut. The frets measure .10″ wide by .04″ high making them jumbos, but I should point out that this guitar has been refretted with stainless frets which not only adds a huge amount of durability, but also increases the brightness or chime of the guitar making it arguably even more Tele-like than when it left the factory. I see some conversations online about these guitars with people saying that they have flat fretboards that are probably 12″ or more. The fretboard radius on the one in my hands as I write this is a solid 9.5″. Though it’s possible that the fretboard was reradiused when the new frets were installed, if that was done it was a masterful job as I see no signs of that. Having the longer scale imparts a higher tension on the strings (given the same tuning) and also makes the timbre of the instrument have a ring or chime to it that is a huge part of the Telecaster sound. The neck is maple and the fretboard is unbound rosewood with simple dot inlays. Some models can be found with cake-knife headstock (see the Introduction) but the one I have has the very Jacksonesq pointy headstock, the design of which is generally referred to as offset. Though I like that style headstock on some Guilds, I think it looks terrible on a Tele-shaped guitar, and from the things I’ve read online the headstock is the #1 thing people complain about with the “Guild Tele”. 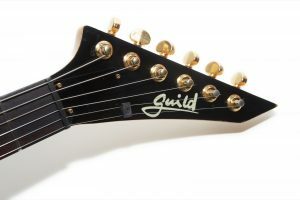 The headstock almost universally leads to descriptions of the guitar that sum up to, “it’s ugly.” I think that the headstock Guild fans refer to as “the foot” would be a perfect match on this guitar but, alas, Guild chose to go pointy. This is a very solid guitar that that feels like it would be useful in the Keith Richards school of martial arts. Being a Tele, there are no signs of anything fancy like bindings or elaborate inlays which is another reason why the gold hardware seems so out of place to me. This guitar weighs 8 lbs 6 oz (3.8 kg) which is pretty heavy to me, but it is a big ol’ hunk of poplar with a maple neck and a solid brass bridge, so I suppose it could be worse. 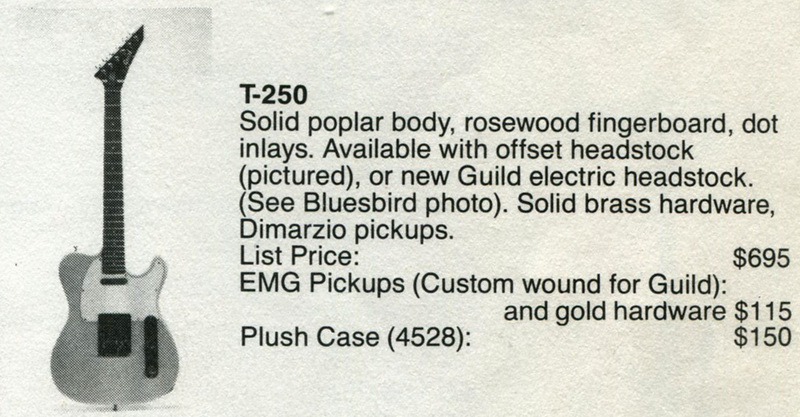 The pickups on this guitar are EMGs and according to the price list they were custom-wound for Guild. The neck pickup in this guitar is labeled FT which seems to represent the EMG FT model telecaster pickup which is a standard alnico magnet offering by EMG with the gold EMG logo reinforcing the alnico magnet component. 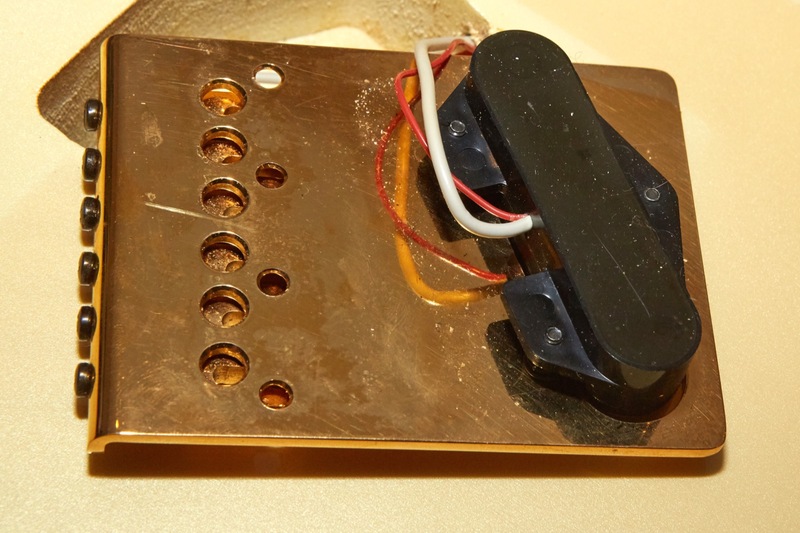 I cannot say for certain that this pickup is original, but it’s got the right look for a late ’80s guitar and doesn’t have the no-solder connections found on modern EMG pickups since about 2009. 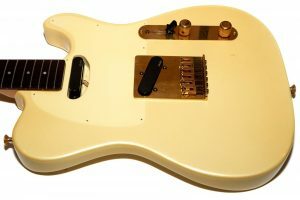 From what I can tell FT stands for Front Telecaster while the comparison pickup would be the RT for Rear Telecaster. I’ve never heard pickups referred to as front and rear before and it took me a while to figure out that EMG had named them as such. 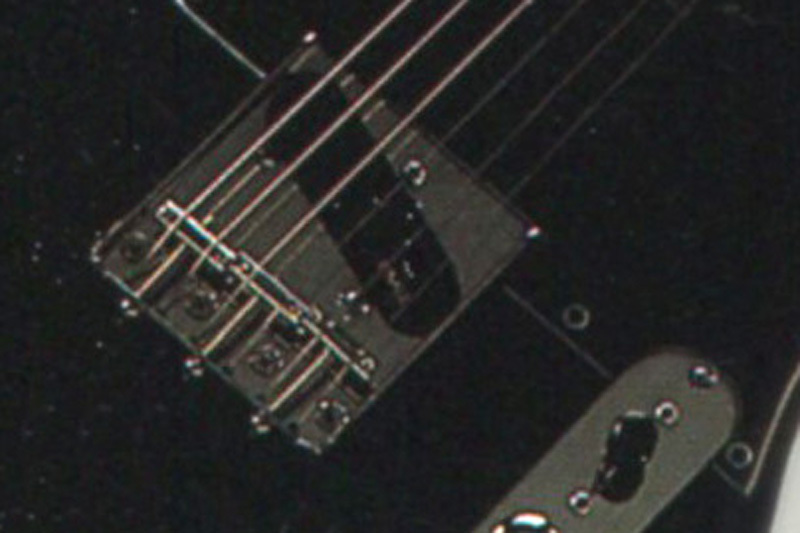 If the neck pickup is an FT and the pickups are original, then the bridge pickup is likely an RT, though there are no indications anywhere on the pickup case to indicate what it is aside from the silver EMG logo which means that the pickup has a ceramic magnet. The pickup again has the look of a late-’80s EMG pickup but without a label there’s no way to identify it or to confirm that it was or was not custom wound for Guild. Sadly, EMG does not keep vintage information active on their website so it’s tough to know for sure, at least with my limited resources. I’ve seen some comments online that the Tele pickups are EMG’s best pickups and I have to say that I was pretty pleasantly surprised by them in this guitar with one possible exception that I cover in the Sound section. The elctronics are pretty standard Telecaster fare with the exception that these are active pickups so there is a battery and a stereo jack to cut it out of the circuit when the cable is unplugged. Of course, these are 25k pots for the active pickups. The wiring in this guitar seems to have been fiddled with by someone, though the only obvious points that stand out are the fact that there are solder blobs on the tone pot which are otherwise not being used and the fact that there is a .047 mF capacitor in the circuit where I’d normally expect to see a .01 mF in an EMG circuit. The guitar was sold to me as having an aftermarket EMG Mid-Boost installed, but there is no such animal in the circuit so maybe someone got sold on a .047 mF cap being a “mid boost”. It’s also possible that the pickups are not original so bear that in mind when considering this wiring. Capacitor values aside, this guitar behaves and sounds like a Telecaster and has all the spank I’d want in such a guitar. The tone knob does roll the guitar down into the mud, but I’m not a big tone knob user to begin with so that doesn’t bother me much. About the only thing that’s really different about this guitar from a normal Tele is the fact that it’s got active pickups so there is the inclusion of a battery in the mix. The guitar has a nicely routed chamber for the battery, but you do have to remove screws to access it. That’s still a lot better than having to remove the pick guard, though on a guitar like this there wouldn’t be any room for a battery in there, anyway. As mentioned previously, every bit of hardware on this guitar is gold. Most of it is also brass, too. As a fun aside, this is one of the Guild electric guitars where the serial number stamp ends up partially underneath the tuners as a result of what I can only imagine was either poor planning or one department not talking to the other when this guitar was being made. I mean, there’s plenty of room on the headstock for the serial number to be stamped outside the realm of the tuners. The Guild X100 Bladerunner (which was made around the same time) often exhibits this problem, too, though those are often worsened by the finish filling in the stamped number making it impossible to accurately identify many of them. The tailpiece is brass and quite heavy and the saddles are of the type that I generally dislike on Fender guitars, though to be fair they function fine – I just hate the way they look. 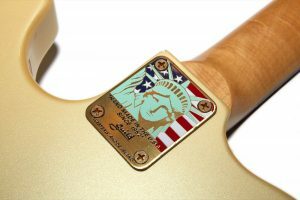 One thing that stands out on this guitar is the neck plate which is adorned with the visage of the Statue of Liberty and the phrase, “Hand made in the U.S.A. since 1952.” I imagine that since 1987 was Guild’s 35th anniversary that perhaps this was a fun way to celebrate that fact. 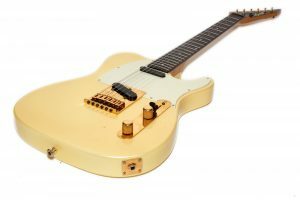 The hardware is all of top-notch quality, but as I’ve already stated I personally feel that gold hardware has no business on a Tele-type guitar. 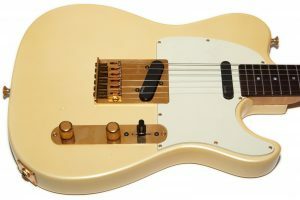 A Tele is a working man’s guitar as driven home endlessly on the radio by Bruce Springsteen during the ’70s and ’80s. Certainly, the American Deluxe Telecaster by Fender adds some bling to the Tele with stuff like body binding and pearloid pick guards, and there are some custom shop Teles out there with gold hardware, but I think it looks odd. Then again, if gold hardware on a Tele was good enough for Buck Owens or, you know, Roy Buchanan, then who am I to judge? Oh wait – this is not a Roy Buchanan model! Pick up this guitar and start playing and you are rewarded with all the spanky honky tonk character that you expect from a Tele. Yes, it’s subtly different because of the rosewood fretboard, but I greatly prefer rosewood over maple so that works for me just fine. The other obvious difference is the pickups since they are active EMGs, but where EMG humbuckers can sound sterile I didn’t get that vibe from this guitar which could be why so many people consider these to be the best pickups EMG ever made. I don’t have enough experience with different EMG models to make that claim, but I will say that I was pleasantly surprised at the tone from this guitar. As usual, for these recordings I used my normal Axe-FX II XL+ setup through the QSC K12 speaker recorded direct into my Macbook Pro using Audacity. I recorded using the ODS100 Clean patch, as well as the JCM-800 and one through a setting called Citrus which is the “I wish it was still the ’80s” Orange amp setting I like so much. The last one is the USA Clean patch which is supposed to be a Mesa Mark IV on clean. For each recording I cycle through the neck pickup, both pickups, and finally the bridge pickup. All knobs on the guitar are on 10 at all times. I should start by saying that I’m not completely happy with the recordings, specifically on the JCM800 patch. I’m not entirely sure what happened there because I use the same rig down to the cable for every rundown which leads me to believe that this issue has to be the guitar. It’s quite possible that the guitar just doesn’t interact well with the Axe-FX on that setting which is unfortunate because I expected it to sound killer. I really like the guitar on the clean amp sounds which is why I added a USA clean recording. I also liked the guitar a lot on the Citrus setting so the guitar is not afraid to play with high gain; it just didn’t seem to get along with the JCM800. Overall I liked the sounds that this guitar could produce and thought that it was sufficiently Tele-sounding to my non-Tele-guy ears. I’m mostly a humbucker player but when you need that Fenderish sound then you need the right guitar and the T250 will get you there. Because I’m primarily a humbucker guy I often find that Teles can get damn-near unpleasant sounding when pushed with the bridge pickup and I felt that way with this one, too. I imagine pairing it with the right amp would make all the difference in the world. Finally, I have to point out that this guitar is an absolute sustain monster and a strummed open chord just rings and rings. That was actually one of my favorite aspects of this guitar during my testing. For the most part this guitar is a Tele and if you’ve ever played a Tele then you know what it plays like. The main obvious difference is the rosewood fretboard since most Tele owners I know favor maple. To be fair, maple is kind of iconic and imparts even more chime to the tone of an already bright guitar. Personally, I’ve never liked maple as a playing surface and greatly prefer rosewood (or even better – ebony) on my guitars, so the fretboard doesn’t bother me at all. 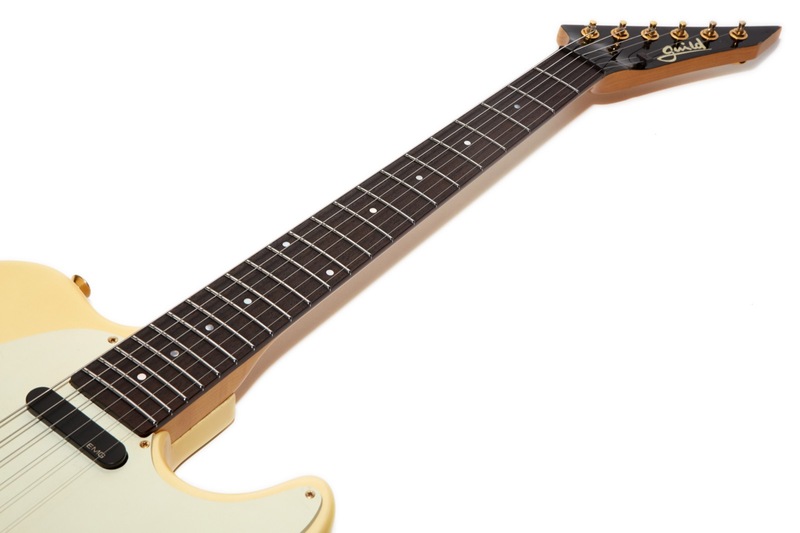 Another change from a traditional tele when it comes to playability is the bridge. 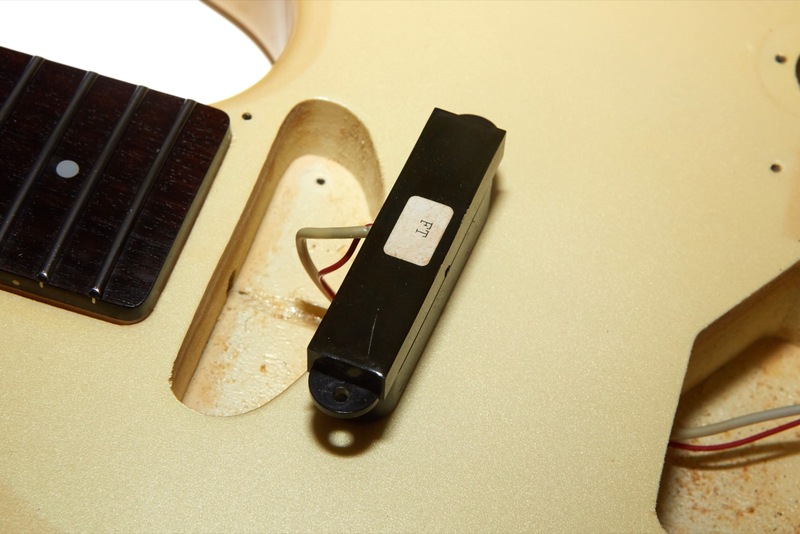 The bridge feels very different from a vintage tele because it doesn’t have the whole ashtray thing going on so it doesn’t have the ridge around the outside. I’ve never liked that ridge, but if you’re expecting the feel of a vintage Tele that’s probably going to annoy you. Similarly, the saddles are more modern than the vintage design and though they work just fine, they’re different. It actually feels just like a modern American Standard Telecaster because the bridge and bridge plate are both pretty much the same, so if that’s what you’re used to then you’re in luck here. The biggest issue for me on this guitar is the lack of a forearm bevel but then I guess that makes me a wuss. It’s also not that much of a problem except if I play it for long periods of time after which my arm goes numb. That could very well be due to my multiple martial arts injuries that required surgery so your mileage may certainly vary. The guitar is slightly neck-heavy which is really only a problem for me because my favorite strap is a nice leather El Dorado that’s slippery. With a grippier strap the guitar stays put just fine. This is absolutely a quality guitar in every way. Sadly it suffers from some odd design decisions which are either thanks to Guild (it wouldn’t be the first time) or maybe Roy Buchanan. It’s also very possible that it’s due to a combination of both. 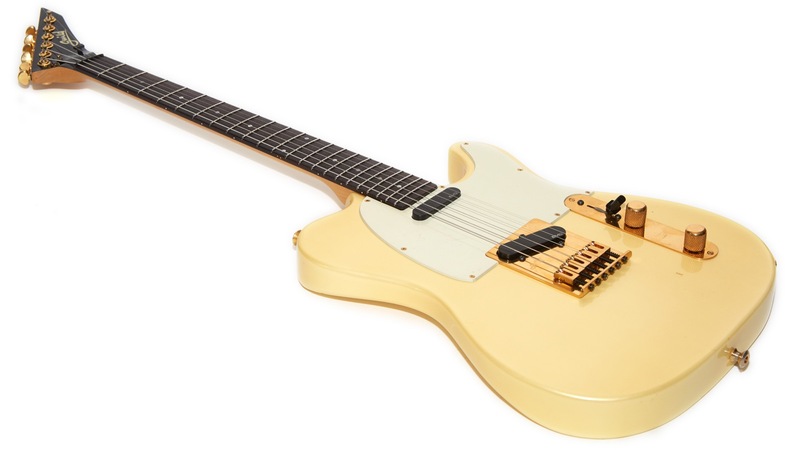 Sure, I think the gold hardware looks goofy on a Tele and the pointy headstock is a deal breaker for a lot of people, but neither of those things affect the playability or sound. It’s a little odd having active pickups in a Tele, but I was surprised at how much I liked them and was also surprised that this guitar delivers the Tele spank that is the hallmark of the design. I think this guitar suffers most from not fitting into people’s molds. It’s not vintage correct enough for a lot of Tele lovers, and it’s not really Guild enough (whatever that means) for Guild lovers who chase Bluesbirds, S100s, or S200s for that matter. Its pointy headstock makes it easy to revile by the hoards of people that hate pointy guitars, and it’s got a rosewood fretboard so purists have one more reason to say no. All of that is a shame, though, because this really is a great guitar. Where those design missteps can play into your benefit is that you might just find one in a pawn shop somewhere for a great price and if you do, I suggest you give it a chance. You might just fall in love with this pointy headstock mostly Tele-like Guild. Hi I enjoyed reading about your Guilds. 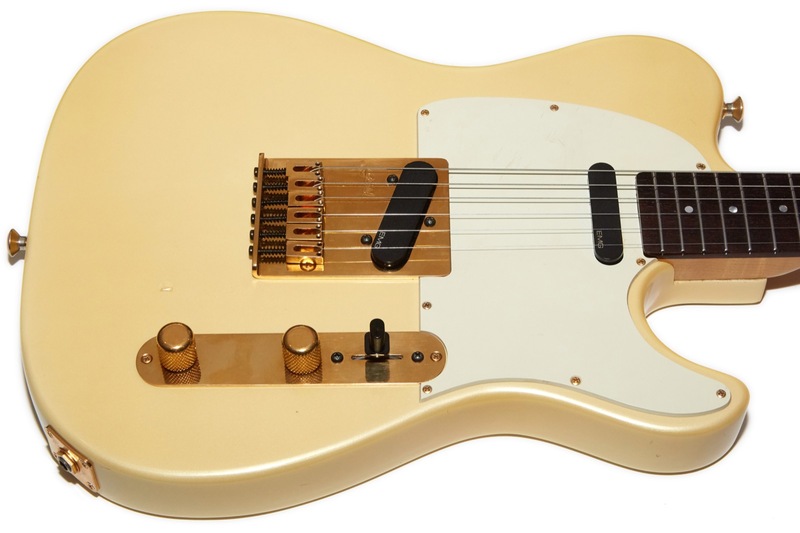 I am not being picky but you said in the Guild article on the Guild T-250 – The Not Roy Buchanan Guild Tele that these are the only Tele Guilds that they made but this is a EG71Cr. I believe factory original except the prior owner reshaped the headstock and put a Fender label on it. It does play amazingly well and as you said about the T-250, this is a sustain monster. Have you ever seen this model?? I can send photos if you wish. Thanks God Bless Hope you and your kids are well. I’m not familiar with that model number. Is it a crossroads? I’d love to see pics. I stumbled on a Guild T250 oddly enough in southern New Jersey. Mine is all chrome. It has passive Seymour Duncan pickups though the body is routed for the d battery for active EMGs. No way of tracing the guitar further. I purchased it from a pastor who explained that it was left in exchange for money owed on an auto repair at a garage owned by someone in his flock. If you are interested in seeing photos (I posted one on the Guild owners and fans Facebook Page) let me know. I very much enjoyed your article. Thanks! I saw your post there. Pretty cool. They’re surprisingly great guitars. I think they would have been more popular with a less polarizing headstock. I have a black T250 w/o the liberty back plate. Gold with the emg’s. plays great. Did they only put the liberty back plate on for a short time?